Cristie Fuller has been a passionate American Tribal Style dancer since 2002 under the tuition of Devi Mamak and is a member the professional troupe, Ghawazi Caravan. Along with intensive training and performing with Devi, Cristie has studied with Carolena Nerricio almost yearly since 2003 including traveling to the Fat Chance Belly Dance studio, San Fransisco in 2004 and completing the General Skills Certificate with Carolena in 2007. She has taken workshops with Jill Parker, Paulette Rees-Denis of Gypsy Caravan, Rachel Brice, and many other local and international dancers. Cristie has performed extensively, loving to dance at both small parties and large events such as festivals and stage shows. 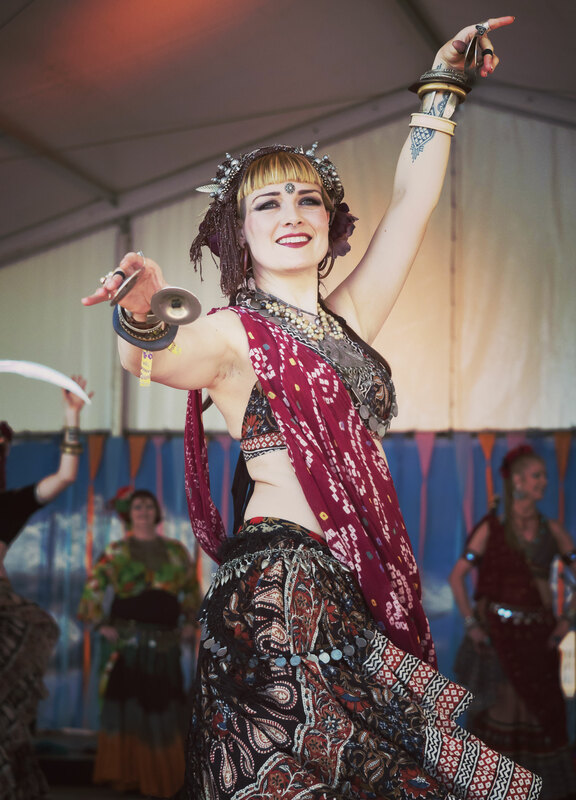 Cristie teaches ATS and Fusion at Amera’s Palace Marrickville on Monday nights and directs the troupe, ‘Oreades Tribal Bellydance’, a sister-student troupe of Ghawazi Caravan. After taking part in Devi Mamak’s teacher training program in 2008/09, and 2013, she is a relief teacher of Devi’s regular classes as well as conducting workshops at festivals such as the Playground Weekender music festival and guest teaching for a term for Hips Don’t Lie Academy of Bellydance and Nepean Community College. Her teaching focus is clear, concise break down of moves, prioritising technique and posture and how they relate to group improvisation and sharing the excitement and fun of dancing. What other styles of dancing have you done? Very brief foray into Rock and Roll, a small amount of Cabaret last year and quite a bit of my own kind of freestyle boogie in the lounge room. How long have you been doing Tribal style?? Since May ’02. I first saw Ghawazi Caravan perform at a street festival not long after I moved to the Blue Mountains. I was blown away and thought, “I want to do THAT!”. I enquired about classes and couldn’t believe my luck that this amazing style was taught only 10 minutes from where I live. I started classes with Devi and…. In September ’03 I performed for the first time at Lawson Carnivale. What appeals to you about Tribal? I love the idea of improvisation. This format of strong, defined movements, cues and communication between dancers – discipline mixed with spontaneity – is magical to dance and to watch. As with many art forms, it is the boundaries or rules of the medium that produce the most creative and satisfying results. Although ATS is the only style I’ve studied and Ghawazi Caravan the only organized group I’ve ever joined, it seems that ‘Tribal’, in particular, is not just a style but a mindset. Everybody in our group wants to progress for personal reasons but equally for the good of the group which is a very special thing. …. And I really dig the costumes. If Tribal is your current passion, what was your previous passion? Drawing, designing and sewing clothes. I studied fashion design and for much of my life, that was a great passion. Dressing up continues to be! Where do you see yourself and Ghawazi Caravan in the future? Continuing to refine and perfect our style. Continuing to have fun. I’d love to see us performing at some Australasian tribal festival alongside a healthy and inclusive tribal community.